UPDATE, MARCH 25: The Tulsi campaign obtained 1,643 new donors yesterday (Sunday)! Nice to see things continue! Only 17,516 more donors needed! The Tulsi campaign informed us that they had gotten 1,600 new unique donors yesterday alone. This is trending from 2,000-2,200 three days ago, and 1,780 two days ago. 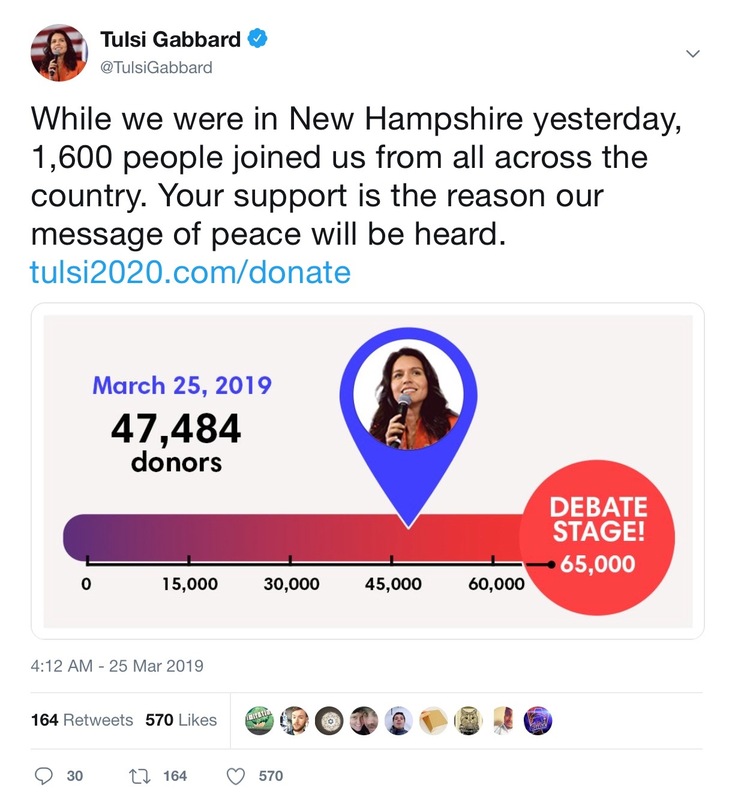 At this point, Tulsi needs 370 new donors per day until May 15 to reach the 65,000 unique donor cutoff for the Democratic debates. She needs 19,159 more. She is on a very good pace right now. Yes, the numbers per day are dropping, but that was to be expected after the initial announcements of where she was at in the count, and they are dropping very slowly--which to my mind was rather unexpected. Tulsi has been tweeting about banning Roundup (from Monsanto) over the past couple of days. She is so good in the question and answer sessions. Speaking from the heart (I hope). Here she is on a NH public radio show "The Exchange" in a hour long interview this weekend.